I've spent the last week not-reading a book I'm just not feeling. I've flicked through it on my commute, read a few pages and then resigned myself to staring out of the window/at my phone/listening to a podcast/dozing. All because I'm "not allowed" to read my holiday books until I go on holiday. And I feel like I do this every year. Holidays are the only time I really treat myself to new books. I give myself a budget of about £25 and get myself 4 or 5 books, but I'm not allowed to read them til holiday. So every year, I end up with this dead week, when I've finished my most recent book, but I'm not allowed to start my holiday books, so I root through my shelf and undoubtedly start something I'm not that into and then abandon it before I leave for the airport, never to be finished. And sometimes I'm not sure where the line is between being self-disciplined and just being plain old mean to myself. I do a lot of things I don't want to do. I don't always want to get up at 5.30am to go for a run. I don't always want to come home from work a cook a healthy meal from scratch. I don't always want to turn down social activities for running or choir practice. But I'm committed, I'm dedicated and I'm disciplined. And sometimes I don't know if it's always a good thing. I'm not saying I'm always disciplined. I'll often eat the last cookie or go to bed early but actually spend half an hour scrolling through Facebook. But believe me, I'll feel bad about it. I'll feel bad if I "waste" my bus journey to or from work by not reading at least 20 or 30 pages each way. I'll feel bad if I "cheat" with something pre-made when making dinner. I'll feel bad if I miss a run, even if I'm exhausted. I spend an awful lot of my life feeling guilty. I love being disciplined. Without my self-discipline I wouldn't have been able to train for a marathon, or have run this blog for nearly 7 years, or cook healthy meals every evening, or run a home on top of everything else. But sometimes I'm just a little bit too hard on myself. I've cried because I've been 5 minutes late out for a run, I've beat myself up when I was too exhausted to cook after a 15 mile run, I've panicked when I've spent money unexpectedly because I keep a running total of my monthly expenditure and budget for everything. But maybe life is too short to read books you don't enjoy, or to go for runs when you need a rest, or to feel like you're missing out on life sometimes because you're so focused on your end goals. Being dedicated and disciplined is good, but maybe it's not everything. 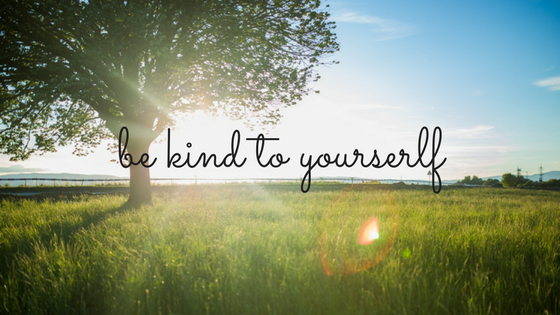 Maybe we need to strive towards our goals, but perhaps we need to be a little kinder to ourselves along the way.